By all meaningful measures, credit markets today aren’t any different than they were after the first “dollar” wave crested and subsided. Despite all that has transpired all over the place in 2015, this resiliency is worrisome. No matter how much commentary wishes it to be a comforting tool of monetary policy adjusting into economic salvation, the fact that these indications predate any such acknowledgement renders a very different judgment; as does the steadiness in the bearishness of it all. Perhaps that is most apparent in market-based inflation indications. Janet Yellen has made inflation expectations the centerpiece of her economic coloration; by default since there is nothing else. She has persistently defined successful monetary policy transitioned from sustained economic growth and recovery as just such a matter. 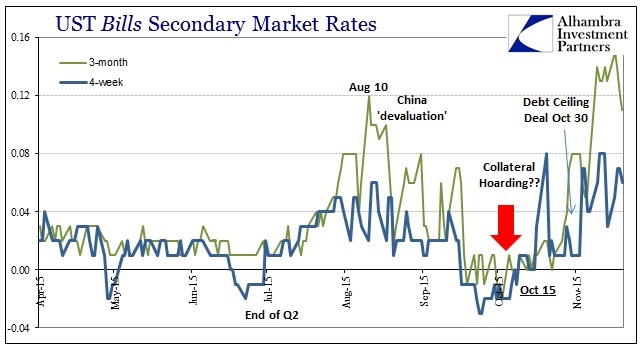 However, as she is reluctantly forced to admit, there is none now (in the official statistics) and credit markets foresee even less for the near term. 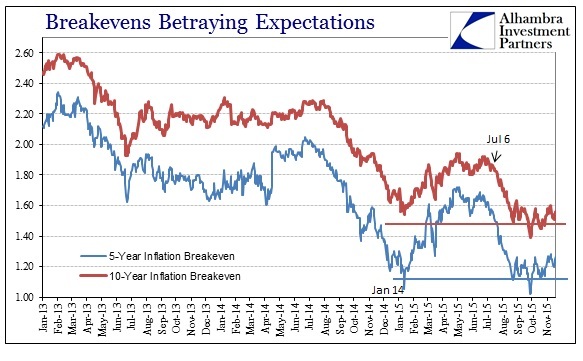 In fact, for the most part, traded inflation expectations in TIPS have remained at practically the same dire level as that from again the first “dollar” wave, having sunk to that point in the August liquidations. More importantly, they have hardly wavered since no matter how much Yellen talks and the FOMC declares its (wavering) courage. In fact, for the Fed’s “preferred” inflation indication, the 5-year, 5-year forward calculated rate, the indications more recently are actually much worse than at the start of the year. The “expected” inflation rate via this view is, and has been consistently, as low as the depths of the Great Recession. 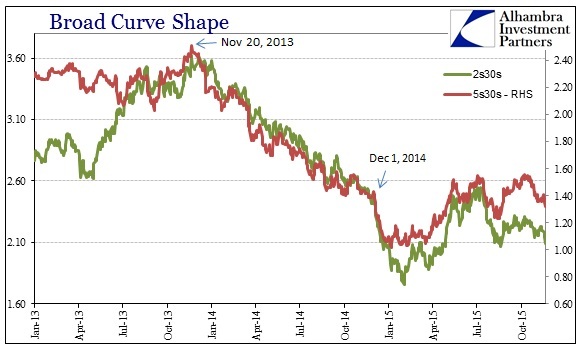 Likewise, the rest of the treasury yield curve has remained similarly depressed/flattened. In recent weeks, the 2s30s spread has fallen much faster than the 5s30s suggesting only the influence of the “hawkish” Fed in its tendency to make matters worse. 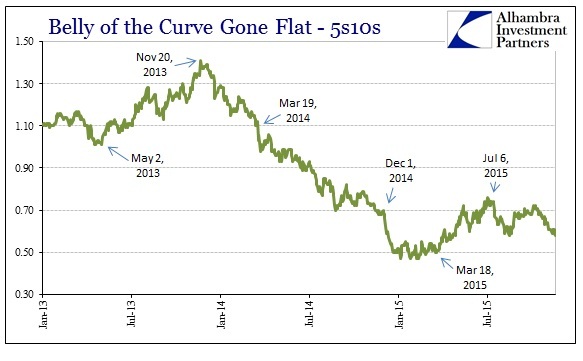 That the curve should be so steadily flat in comparison especially to 2014 conditions is quite a negative statement about the growth narrative and the actual construction and relay of interest rates in general (more below). 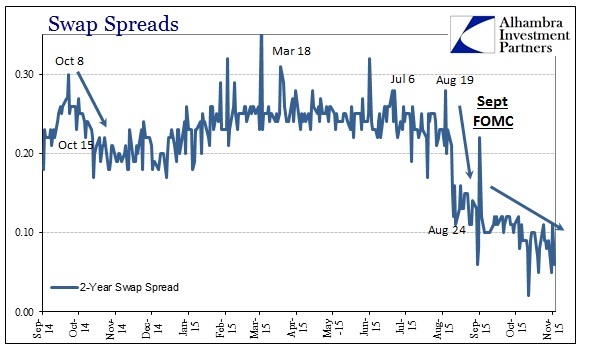 The indications through swap spreads, quite compelling just in their own regard, are fully consistent with this general picture of fixed income. The FOMC declares nothing but brighter skies even though the treasury curve and inflation trading are at least as negative as from the start of the year. 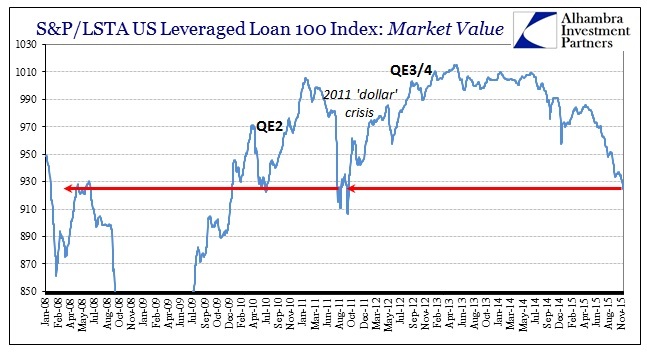 However, funding markets have taken a decidedly nasty turn in equally consistent (as a second derivative) fashion. Eurodollar rates have again surged, especially yesterday, which leaves money markets clinging to an even more precarious state. 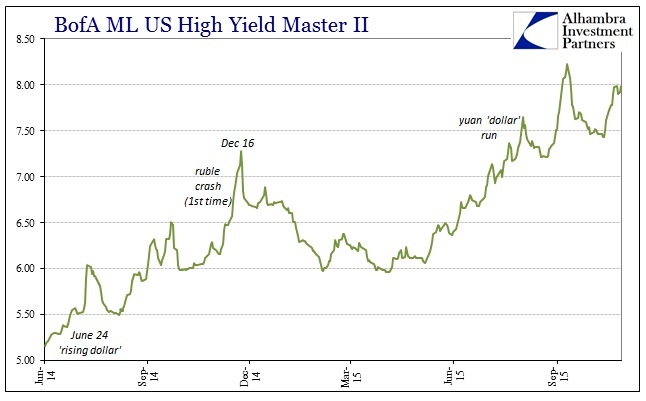 That interpretation extends to risk indications, as well, since the TED spread, for example, demonstrates the perceived deterioration in credit risk – this despite the elevation in UST-bill rates of late. In other words, both LIBOR and bill rates have jumped only LIBOR, now even the 1-month rate joining, by far more resolutely. 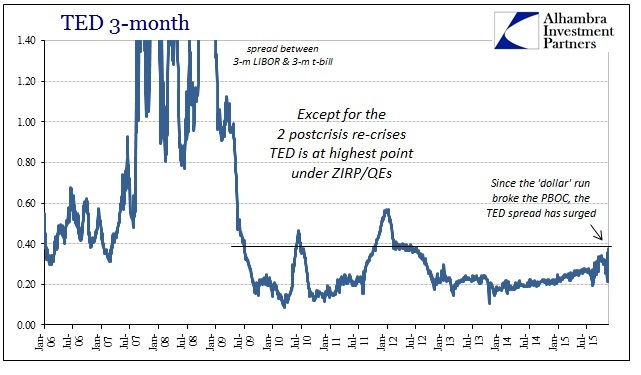 The TED spread here is equivalent to October 2011 and June 2010; neither of those periods were associated with shining or fulfilling expectations, instead both were dead within high concern over very real possibilities (warranted) of renewed crisis. 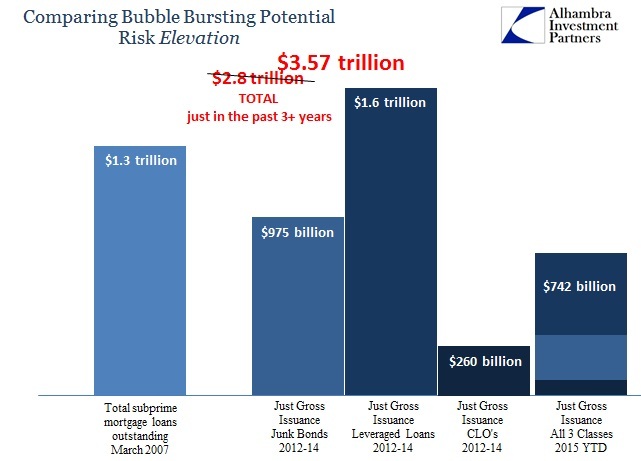 In other words, in the age of ZIRP TED has rarely been more alarming. 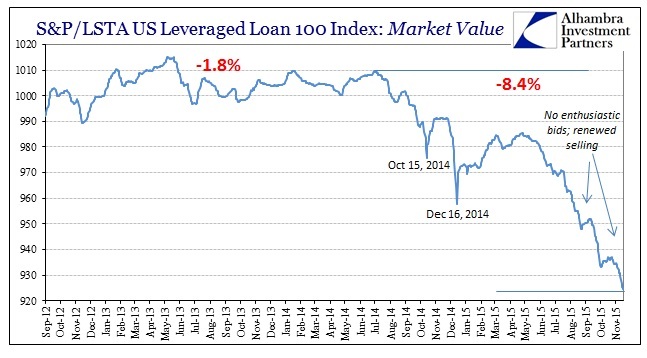 As you would expect, funding difficulties in money markets have translated directly to pricing in the junk bubble. 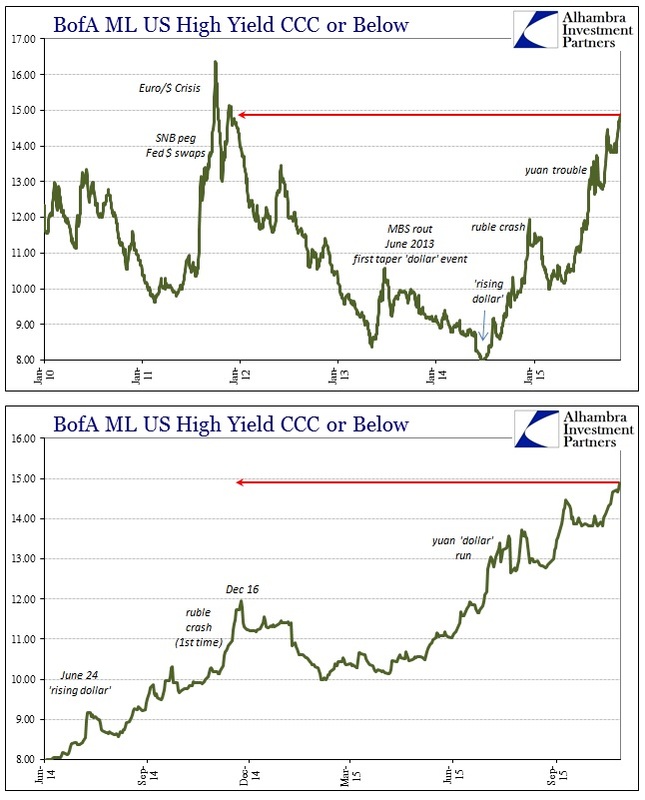 Again, dependably, high yield credit continues to get pummeled; leveraged loan yields and other institutional junk rates have surged as LIBOR has, with prices now equivalent, also as LIBOR, to the pretty dark days of the 2011 “dollar” difficulties. 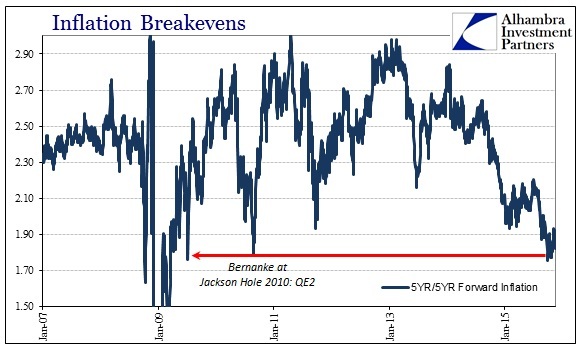 Given the enormous size of the junk bubble, there can be nothing other than great concern and further funding difficulty as this selloff accelerates. As detailed a few days ago, this is directly in violation of the orthodox understanding of spreads within rate behavior. 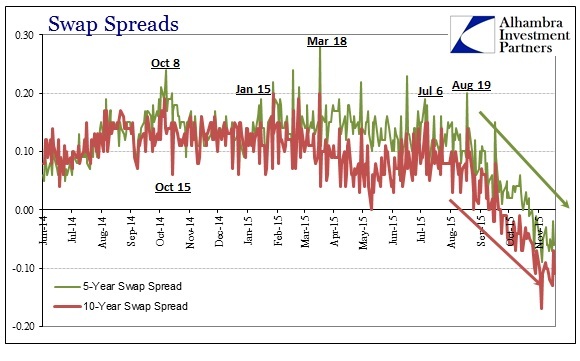 The swap spread indicates funding and liquidity risks rising, to the point that swaps rates themselves violate their paired treasury rate to perform a dissection from the “riskless” starting point that economics theorizes. Thus, that indication of liquidity difficulty is being transmitted, as noted by the discussion above, into various other spreads and rates that are nonconforming to the policy attempts at control over “riskless” conditions. 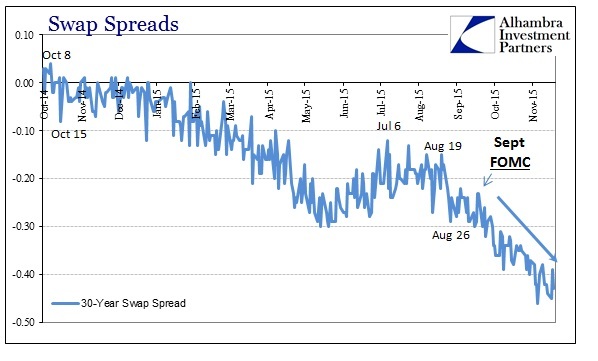 That extends to the hardened bearishness of the treasury curve itself, as the backwards nature of especially the longer end echoes the transcendence of orthodox understanding via swap spreads. By expected count, with both rate hikes and proclaimed recovery(even a boom upon us by all annual projections), the curve would be steepening, and dramatically at that, if Greenspan and economists were correct about basic finance. Instead, contradicting Greenspan, the treasury curve itself at the long end is acting independently in concert with swap spreads likewise acting independently. Further, those conditions are training credit spreads elsewhere, including corporate and especially junk, to also attain independent argument from monetary policy and its “riskless” starting point. So what fixed income markets broadly are suggesting is the same as swap spreads in terms of orthodox understanding; no wonder Janet Yellen is left shouting about only “professional forecasters” as the whole of bond and funding markets have left her side long ago. That there isn’t even a trace of returning to the mainstream fold is the more relevant analysis here, with sweeping implications for not just the immediate future but the state of the whole monetarist project. By each count, spreads and rates are keyed if not fully independent of the policy attempt to influence at the “riskless” point then at least so with regard to other independent elements more directly. Fixed income markets just are not buying the recovery story, meaning that, once more, the Fed’s influence is left to at best to make it all worse. This has been the case all year where markets most directly in line of such theoretical “dependency” have consistently stayed out of influence. 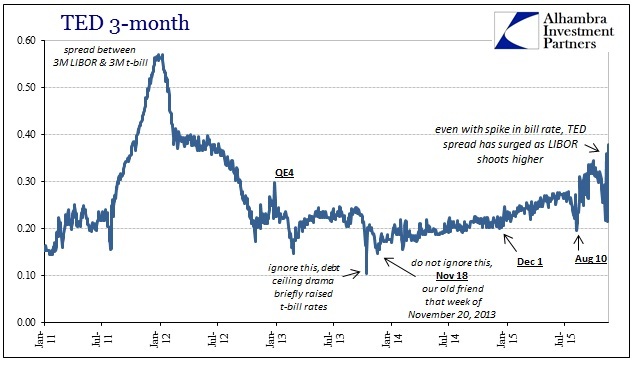 In extension of funding markets, such independence has been to produce rates, spreads and levels duplicative of some very dark times in 2011, if not late 2007/early 2008. 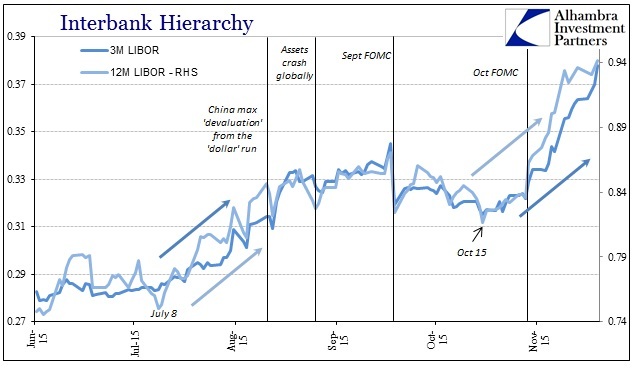 Unlike the Fed’s econometric models, those actual market indications are much more consistent with both the global economy and the grudging mainstream acceptance, if still downplayed, that maybe “something” serious could be wrong here.